Finding an apartment in Houston can be time consuming and frustrating, there are literally hundreds and hundreds of apartment complexes to choose from, whether you're looking for a luxury high rise, a mid-rise with a view, or an affordable traditional style apartment, I can help you find what you're looking for. I have years of experience helping people just like you locate the best possible apartment for their needs, if you would like my FREE help please contact me at 281-782-3270 or click here to email me. Please remember, I give Rebates to my clients, so be sure to use me as your referrer the next time you lease an apartment, loft or high rise. 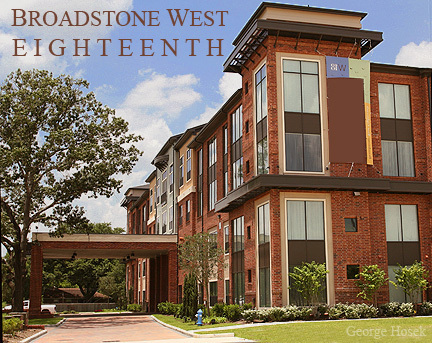 Six of Houston's newest inner loop luxury apartments, including, Broadstone West Eighteenth, 36Sixty, Alexan Cityside, Bayou on the Bend, Metropole and The Bel Air. 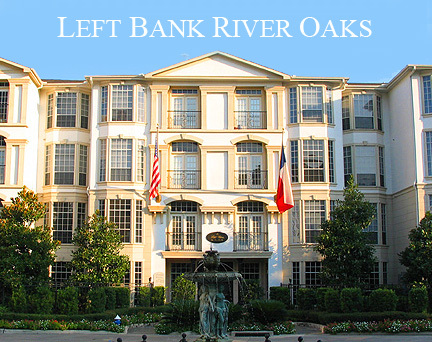 Just west of downtown Houston on Memorial Drive and Allen Parkway you can find some of Houston's nicest apartments, including Bayou on the Bend, Left bank River Oaks and Jackson Hill, just to name a few. One of the major attractions for this location is Memorial Park and its extensive biking, jogging and nature trails. Also, easy access to several major freeways and close proximity to downtown Houston Theater District. Also see Left Bank River Oaks. Living downtown you'll be at center of everything, easy access to the major freeways and the Metro-rail will help you get to where you need to be, whether its work, school or play. Lofts at the Ballpark are located east side of downtown, across the street from Minute Maid Park on Emanuel Street. 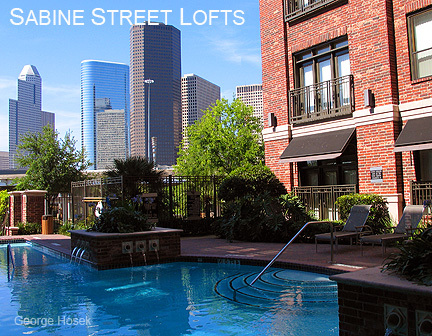 Sabine Street Lofts are located west side of downtown, with great views of the city and access to Memorial park. 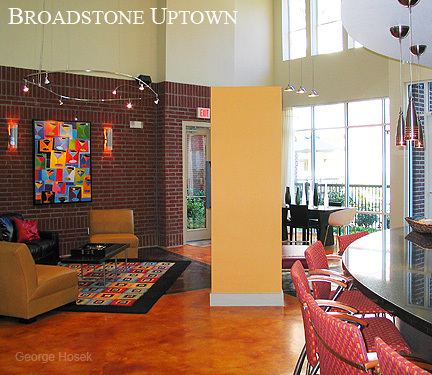 Post Rice Lofts, renovated 18 story high-rise located in the historic Rice Hotel. Alexan Lofts, located just east of downtown, this historic building has been transformed, offering urban living at its finest. Humble Tower Apartments is a luxury high-rise, call early and reserve a unit, one bedrooms can be hard to come-by. Houston House, located in the center of downtown within walking distance of Metro-rail, has outstanding views in all directions, for a price most anyone can afford. 230 West Alabama is another affordable high rise located close to downtown. Located on the southwest edge of downtown Houston you'll find the close-knit community of Midtown, known for its trendy, young professional crowd. Usually, the bars and restaurants that are within walking distance are full with vocal crowds of hungry office workers, recently home from a hard days work. On the weekends you'll find people walking their dogs, jogging, having a cup of coffee, sitting under a tree or just socializing with a friend. Midtown was undiscovered a year or so ago, but no longer, now finding a 1 bedroom apartment can be difficult, so start a bit early and you may just find yourself living in one of Houston's up and coming neighborhoods. 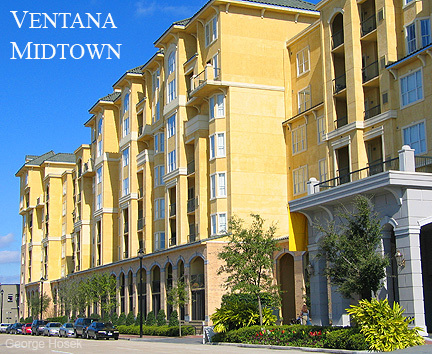 Ventana Midtown is a striking eight story concrete structure clad in brick and stucco, located just south of downtown on Fannin. If shopping is your thing then Uptown may be the place you're looking for, located within minutes of The Galleria, the crown jewel of the Houston shopping scene, features hundreds of upscale department stores, such as Gucci, Armani Exchange and Versace, there's also a skating rink and a large selection of dining options. There are apartments for all incomes near the Medical Center, it doesn't matter if your on a budget or looking for something on the higher end, there's something for everyone in this area of town. If you're an employee at The Medical Center or a student at nearby Rice or U of H you may qualify for an additional discount. The Metro-rail is within easy access to many Medical Center apartments. Some of Houston's best know tourist destinations are nearby, including world class museums, a public golf course, the Houston Zoo and many other attractions including Hermann Park. 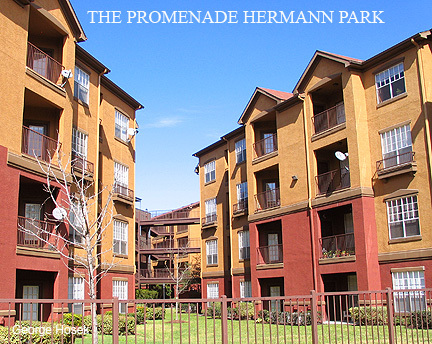 The Promenade Hermann Park and The MacGregor Apartments are both located close to Hwy 288 and MacGregor, an ideal location for getting a quick start on your morning commute. Home to NASA, Clear Lake is a bustling community with a large and varied population with a great deal of recreational opportunities, everything from sailing, jet ski, power boats, nature walks, tons of restaurants and night clubs, etc, etc etc...there is a lot to do in Clear Lake. 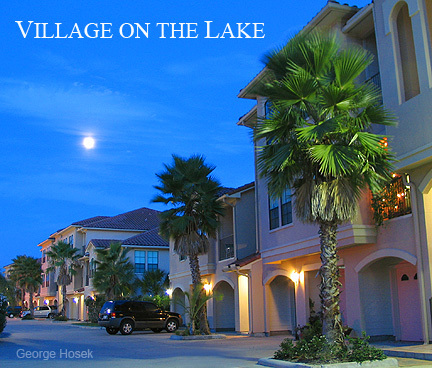 Village on the Lake is a beautiful upscale property with stunning views of the lake. About 20 miles south of downtown off Hwy IH-45 you'll find the cities of Friendswood and League City, both are ideal locations for access to Houston, Clear Lake and Galveston. Head down Hwy 288 south towards the coast and you'll come to the city of Pearland, over the last few years its been one of the fastest growing cities in the Nation. Growth has slowed lately, there's just no more room left, the growth has moved further south to the little known town of Manvel, ask me about the new apartments that have recently sprung up in Manvel. There are not as many apartment complexes in Pearland as you would imagine, ( most people live in one of the many new home communities, such as Shadow Creek Ranch or Silver Lake ), but the ones that are available are nice and within most peoples budget. 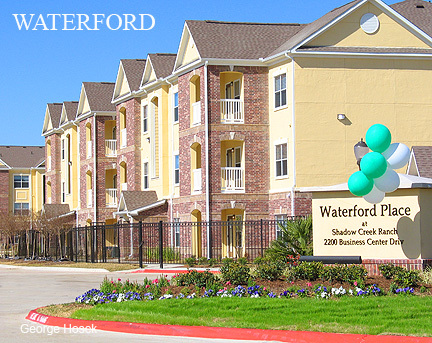 See also, Cobblestone Park Waterford is a fairly new apartment complex located in the Shadow Creek Ranch community. Be sure and ask me about these outstanding apartments. 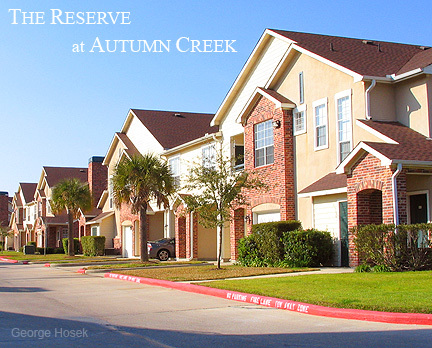 The original master planned community, they are what other communities strive to be. Located north of Houston The Woodlands has much to offer, a mega mall, a river walk, the Cynthia Woods Mitchell Pavilion is home to concerts from major artist from around the world. There is a extensive choice of apartments in The Woodlands, including some newly constructed complexes. 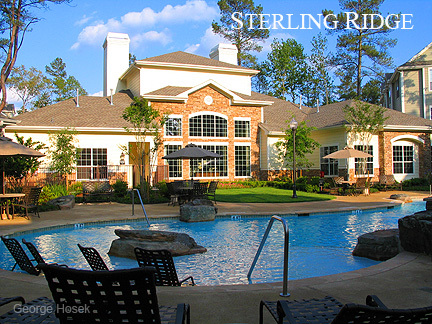 Decent prices and much to do make the Woodlands a great choice for apartment living. Nestled in the quiet western suburbs, a peaceful luxury retreat where you can observe lakefront living at its finest. 1200 Post Oak is your tranquil sanctuary of urban sophistication, located in Uptown Houston. The Lofts on Post Oak combine the elegance of an upscale luxury condo with the style and ease of an ultramodern urban loft. In this city where monumental skyscrapers rule supreme, The Royalton is the crowning glory of Houston’s urban revitalization. This is an important question for everyone but a difficult one to answer. Of course, the area of town plays a roll, but it basically comes down to the apartment complex itself, usually you get what you pay for. I've found luxury high rise apartments have the best security, followed by the newer mid-rise communities, however, no property is completely safe. Things to look for; security gate ( with guard ), high fences, video cameras throughout the property, gated garage, police living on property, clean and well kept, neighborhood or community watch. A. Be aware of your surroundings, especially in parking lots and garages. B. Carry a can of mace. C. Be sure and have the locks changed on your apartment before you move in. D. Always use the peep-hole when answering the door. E. Never leave your doors, or windows un-locked, even for a short period of time. F. Home security alarms are available for apartments, look into portable door/window alarms or a wireless home security system ( things you can take with you when you move ). G. Buy renters insurance, just in case.